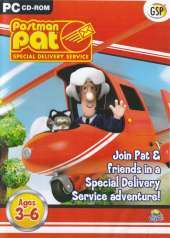 This is a series of educational mini games featuring the BBC TV character Postman Pat. This game is based on a later series of Postman Pat which sees the cheerful chappie in charge of the Special Delivery Service based in Pencaster. There's a big stamp exhibition in Pencaster and there are various obstructions which threaten the event, each of these leads to a puzzle which the player helps Pat resolve. The reward is an animated sequence, progression to the next level and possibly a high score for that game. The puzzles in the game are set in locations around Pencaster and the surrounding countryside. These Puzzles are set in Pencaster: Loading The Flyer - This is a maths game. The player is presented with Pat standing in the doorway of the mail wagon of the train. He needs to sort the parcels so they can be loaded. Parcels fall from the roof of the van and they have sums on them, 4+2, 6+3, etc. The player must move Pat so that he catches the parcel and then take him to the appropriately numbered position on the loading cart to deposit it, no sum totals more than ten. Some parcels do not have a sum, they either have a single number which makes putting them into the right slot easier, or no number at all in which case they are 'wild' and can be added to any numbered pile. There's also a special parcel with the picture of a fork lift truck on it, this clears all parcels from a slot including the ones put there in error. When three identical parcels are placed in the correct slots they disappear making space for more. Parcels dropped into the wrong slot sit there occupying space, they cannot be matched and, if there enough mistakes are made, they will make that number unusable. The player has three lives to complete this puzzle. Repairing The Bridge - This is a pattern recognition game. The railway bridge has collapsed and needs to be repaired. The player is shown the bridge with the collapsed section sketched in in monochrome. There's a grid overlaying the sketch, Pat flies overhead in a helicopter with coloured sections of the picture. The player has to get Pat to drop his coloured section into the correct place on the grid. There's no penalty for a mistake and if a section is misplaced or not dropped at all Pat will eventually bring it again. The Hay-Stack Block: A pattern recognition puzzle using colours and letters. Mr Goggins tractor is loading hay bales onto a conveyor belt. When they get to the top of the lift the conveyor takes them off screen to the left where they disappear. Over on the right is a 4x4 grid where each row is a different colour and each column is represented by a different letter. As a bale appears on the hoist the player must identify the letter, say a green 'M' and click on the cell in the M column on the green row. Each cell placed reveals part of a picture. As with the bridge puzzle if a bale is missed it will come round again. Unloading The Helicopter: This is a Concentration game. Creativity Centre: This is locked at the start of the game and is unlocked as the player progresses. These Puzzles are set in the countryside. The Runaway Farm Animals: This is a Join-The-Dots game. The animals have escaped from their pens. The pens are numbered but unfortunately their numbers have almost worn away so the player must redraw them by clicking on the numbered dots in the correct sequence. Mischievous Jess's Maze: This is a little like a simplified Pac Man game. Jess must navigate a simple maze, eating cat biscuits, avoiding patrolling dogs and hazards, collecting power-ups, before exiting at the correct gate. Gates are usually in the corners and are identified by pictures, at the top of the screen is a word which tells the player which picture is the exit. All puzzles have an animated demo sequence that explains what has to be done, variable difficulty settings and multiple levels.